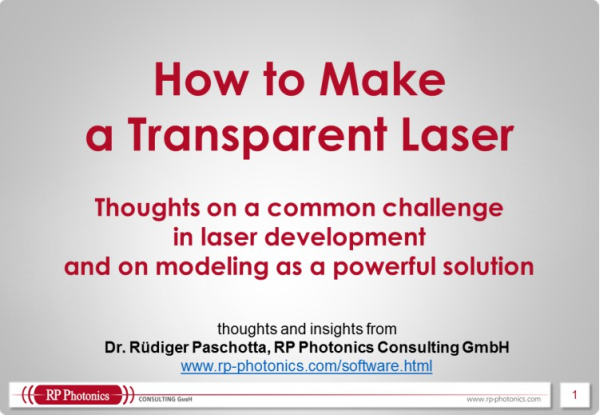 Ask RP Photonics for advice on issues of fiber damage, possibilities for laser design avoiding damage, etc. For some fiber optics applications, particularly in the area of fiber amplifiers and lasers, it can be helpful to use optical fibers with core-less end caps. These end caps are essentially homogeneous transparent pieces with a length of a few millimeters, for example. As the end caps contain no waveguide (fiber core), light propagates in these regions as beams which expand toward the ends. Figure 1: A fiber with core-less end cap. A beam from air is adjusted such that its focus is where the waveguide structure in the fiber begins. Such end caps can be made by attaching (e.g. fusion splicing) small pieces of homogeneous glass to the fiber ends. In case of photonic crystal fibers, it can be sufficient to heat the fiber end e.g. with a fusion splicer, so that the microscopic holes collapse. For a given optical power, the optical intensities at the glass–air interface are reduced. In this way, optical damage of fiber end faces, e.g. in Q-switched fiber lasers or in pulsed fiber amplifiers, can be avoided. Any Fresnel reflections at the glass–air interface cannot efficiently couple back into the fiber core, since the reflected beam diverges further on the way back to the core. This effect, possibly combined with an angled end face, can help e.g. to suppress parasitic lasing in high-gain fiber amplifiers. On the other hand, it is then not possible to use the Fresnel reflection for the output coupler of a fiber laser. For photonic crystal fibers, an end cap (hermetically sealed end facet) can prevent fluids (e.g. water) from getting into the air holes, from which they could hardly be removed due to strong capillary forces.